Sometimes I wonder: Have I gotten too soft, when so many of my Reading for Leading blogs are about relationship? But then I figure: how else can you lead or be led, except in relationship? And this past week offered three ripe examples, one from hoops, and two in the semester’s end. I was in the car and heard an interview with Doc Rivers, the raspy-throated coach of the Boston Celtics. The Celts got knocked out by the Knicks. A reporter asked Rivers what he and his 37-year old 7-foot star Kevin Garnett had said to each other on the court at the end. Rivers said, “I told him I loved him.” And he said that Garnett asked him, “You gonna be alright?” Rivers seemed dumbfounded that his player — who perhaps had reached the end of an amazing career — was worrying about him! 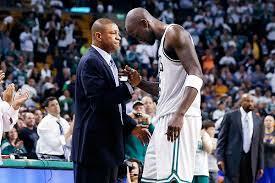 You could tell he was deeply moved as he talked about how amazing KG was. So, I pulled over and tapped out an email to Andre. He’s about the same age as Garnett and a senior in my leadership class at the business school at Berkeley. Andre emails me about once a week and stops by office hours ever few weeks. He tells me some idea or other that he loves. Some concept that he’s practicing at his full-time job, or putting to work as he looks to his future. A couple weeks ago he “warned” me in an email that he’d be high-fiving or chest-bumping me every time he saw me. It was how, he said, he needed to express his appreciation. I wonder if Doc Rivers felt about KG, the way I felt about Andre — that I taught better every single class because of his presence. He led me! Led me out of my head. Led me from my heart. Expected my best. Told me what difference I was making. In other words, he did just about everything I was supposed to be doing for him. And maybe most of all, he humbled me. I felt honored to teach him. We all lead better when we’re touching that true vein of humility that runs near our hearts. “A” led me, too. Her picture belongs beside the definition of iconoclast. She overthrows tradition. In my course, where I urge them to see that because I am the authority does not make me “the” leader (indeed that there is no “the” leader), “A” was more than happy to take me at my word. She pushed back any time she felt the urge. She took nothing on faith. Two weeks ago someone asked me whether their final project had to be solo, or whether they could perhaps do it with a partner. “A” just blurted out, “Of course you can do it with someone else,” then looked at me, as if she could hear her parents saying, “A! Show some respect.” I said, “go on A. Explain.” She did: “This is a class about leadership, so it’s all about working with others and bringing out their best, so of course you can work with someone else” she said as well or better than I might have. Going out the door at the end of the last class, “A” apologized if she had ever offended me. I’m not saying I never felt a little nervous that someone (well under half my age) would so readily seize the power I was offering to share. I definitely felt some deep impulse of fear that I might lose control if all these students followed her lead and decided they wanted to lead. But I told her the truth, when I said I LOVED her interventions and the way she modeled inquiry, intellectual responsibility and a desire to improve what we were doing. As with Andre’s encouragement, A’s challenges brought out my best. Who can lead you — and whom can you lead — from “the bottom” up? I have a ways to go to be the teacher I want to be, but I’m utterly convinced that any greatness I can muster will be multiplied by students — so-called followers — both affirming me and challenging me to do better.